This photo was taken some years ago. 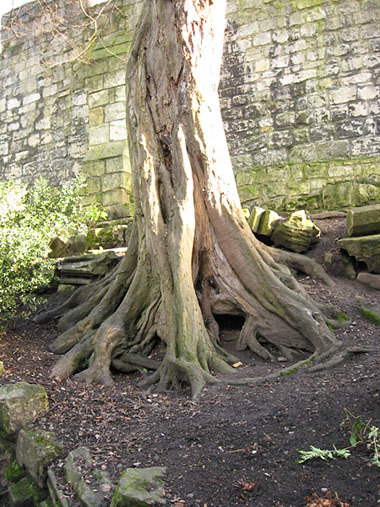 It’s the gnarled and characterful trunk of a tree in a corner of the Museum Gardens, in the shaded area to one side of the Museum, near the entrance to the lane alongside King’s Manor. 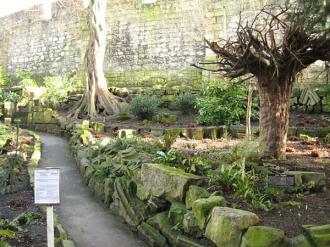 This rather gloomy area has been much enhanced in recent years, with ferns and other shade-loving planting. 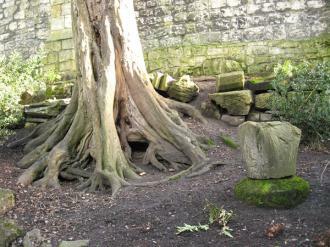 I’ve always thought its main asset was this tree trunk, sculptural like the fragments of stone arranged alongside it. Whereas the stone was carved into shape by skilled human hands, the tree formed itself into something artful and pleasing, contoured and curvy. Not quite so beautiful now perhaps, as its trunk has been, well, truncated. This is what remains. Some shiny substance has been painted on its stump, which has run down its sides. I guess this is meant to prevent resprouting. We all had an opportunity to comment, and it has to be said that this felling was prominently advertised. The notice regarding the proposed felling, close to the tree, in February. Not tied to a railing in a corner as it seems they often are, but placed on a post right next to the path. Visible to all who might be passing and might care. It might be that people did care, but read the justification for the felling and decided that was reasonable. Or perhaps most people didn’t know or didn’t care. What interests me is the contrast with another recently removed tree a stone’s throw away. 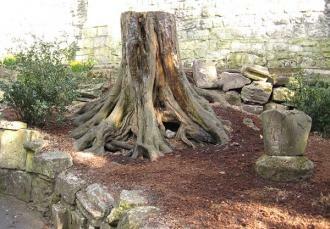 On the other side of the museum buildings was ‘Fergie’s tree’, felled last year. There were articles in the local press, letters of objection, and it even got a brief mention in one of the national papers. Why so much attention given to some trees and not to others? ‘Fergie’s tree’ got attention because it was planted by ‘a royal’ (though I doubt she felt a personal attachment, having no doubt planted loads of trees all over the place), because it commemorated a centenary, and because it was a young and healthy tree. This one pictured above was more mature, and had far more character, but it had none of those associations. So, like most trees, it had no one fighting to preserve it. Other city centre trees have been removed before and since, with in most cases no objections at all being submitted. As previously mentioned, two large trees were removed between the Theatre Royal and De Grey House following an application submitted in autumn 2011, which no one objected to. 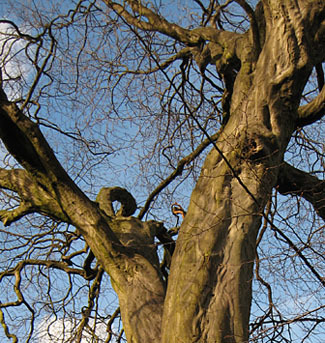 A large sycamore was felled on Deangate – one person objected. Trees have been removed from outside St Crux Parish Room on Pavement, saplings planted to replace them. There are officially recognised ways of valuing trees, as I discovered when following the Irton tree protests and reading the available paperwork. 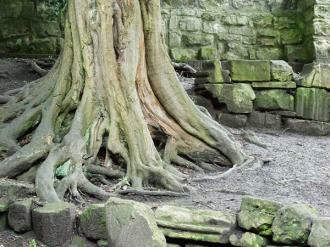 But I’m more interested in the individual views of particular trees. Please feel free to comment on any local tree you particularly value, and say why? The City of York Council’s site did allow access to paperwork associated with planning applications, including tree works, but for some reason doesn’t work so well now, and many documents aren’t accessible. I read the application relating to the tree pictured above, but can’t share the link as it has been removed. The only documents available are a location plan and the decision letter.